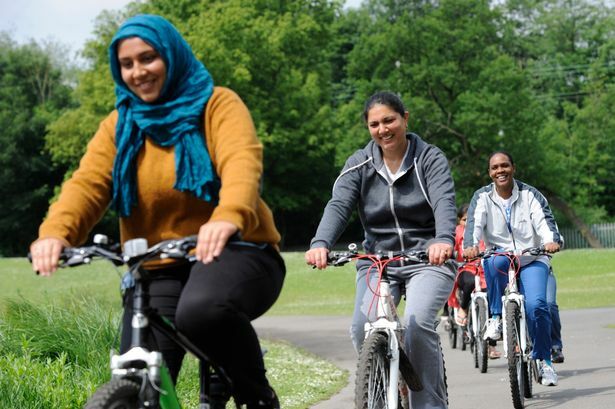 The Women on Wheels cycle club in Handsworth Park, Instructor Sabriha Abdou takes the ladies round the lake. Deputy Prime Minister Nick Clegg has given Birmingham a £30 million funding boost to promote cycling further in the city. The city council has been awarded a £22.1 million Department for Transport grant which, topped up with £7.9 million local funding, will see the existing Birmingham Cycle Revolution – or BCR – scheme extended to the outer city suburbs. It will be used to create cycle friendly pathways along a series of commuter routes including the A34 Walsall Road, A45 Coventry Road, A38 Tyburn Road and Harborne Road. There will also be investment in canalside cycle paths, 20 mph speed limits around schools and busy local centres, a city centre cycle path along Queensway and investment in cycle paths in parks. The funding, which will be invested over the next three years, is on top of the £24 million BCR package which is being invested in improving routes and increasing participation for those within a 20-minute bike ride of the city centre. Birmingham got the largest share of the £118 million Department for Transport funding package split between eight cities. Deputy Prime Minister Nick Clegg said: “We are in the midst of a cycling revolution in the UK but we need to make sure we’re in the right gear to see it through. “That’s why I’m so pleased to announce this investment for these major cities to make it easier for people to get around on two wheels. The news comes as sports marketing firm Sporticel has been hired to find private sponsors to back a mass cycling event, a successor to Skyride, in Birmingham.